Welsh spacemen Sendelica kick off the new year with something that’s a little different for them. (I’m posting this review at the tail end of 2014 but it’s officially a 2015 release as the physical copies won’t ship until January.) The band consists of Pete Bingham on guitars and electronics, Glenda Pescado on bass, Colin Consterdine on synths, Lee Relfe on sax, Lord Sealand on Theremin, and Jack Jackson on drums, plus guests. The fun begins with The Craeft Worker, an electro pulse driven tune with an underlying Kraftwerky, but also space-jazz feel, and a simple yet oh so beautiful guitar, bass and sax melody. The groove goes Motorik on Master Benjamin Warned Young Albert Not To Step On the Uninsulated Air, sounding like a spaced out Neu!, with robotic blazing guitar chords and jazzy saxophone. But as this 12 minute piece progresses the guitar and sax start to dominate, with the guitar ripping off wild Psych solos and chunky metallic blasts, and the sax swinging away. Eventually it all starts to gel and we’re grooving along in heavy Space-Kraut-Jazz rocking heaven. Really killer tune. The Pillar Of Delhi is another song with a simple yet seductive melody, being a lusciously floating deep space dream sequence. I love the mélange of guitar and synth effects and from beginning to end it feels like I’m being gently swept along and at the same time gradually dissolving. Note that Gregory Curvey from The Luck Of Eden Hall contributes “extra guitar” to this track. Azoic continues the melodic dreamland motif, imbuing the music with a majestic, cosmically symphonic sensation. 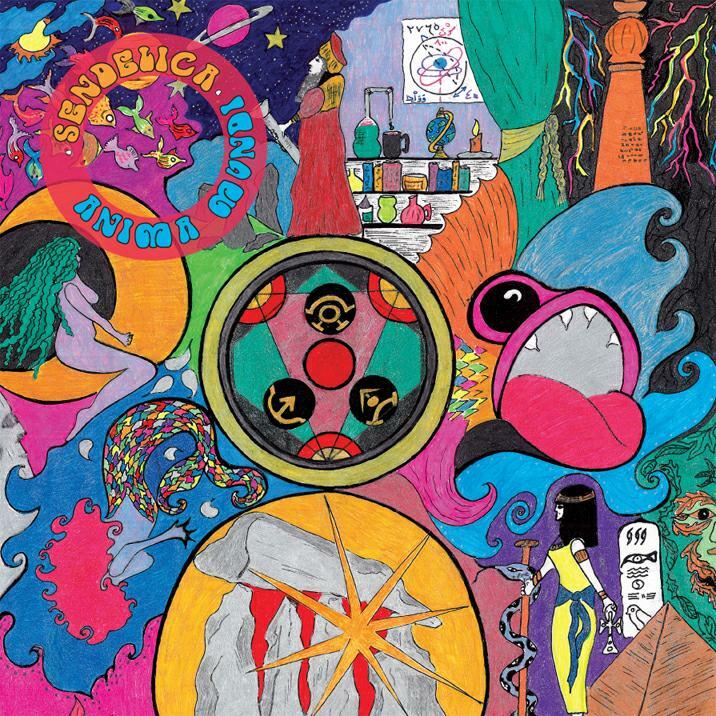 Sendelica get much heavier on Baalbek Stones, which starts off as an aggressive slab of Psychedelic-Metal, and then eases into an electro-funky, alien efx’d, swinging Space-Jazz groover. The Breyr, The Taeogion, and The Caethion also starts off in a Metal realm, with the chunky steamroller guitar and rhythms accompanied by zany effects and a Hard-Psych-Metal guitar solo, which sounds even more cool when joined by the wailing sax, and then morphs into a Space-Psych-Dub-Jazz sorta mash for the finale. Lots of interesting instrumental combinations and stylistic transitions in less than 6 minutes. And speaking of interesting combinations, Searohwit is a deep space floating and grooving tune with impressions that are lightly Arabesque, a wee bit Dub, and incorporates dark yet meditative atmospherics and bubbling electronica. The flute from guest Virginia Tate is a nice touch too (she also contributes keyboards). Finally, The Hedge Witch sounds like an 80s piano and synth driven electronic Pop tune, but Sendelica add freaky effects and drones and even a bit of dreamy smooth Space-Jazz. In summary, Anima Mundi was a surprise, and a pleasant one because it further highlights Sendelica’s ability to cover all manner of territory without going completely off into left field. Those who have been following the band will be pleased. Note that the album is available in several flavors: CD, black, blue and clear vinyl LP, a DVD of the album as video, and an already sold out box set with vinyl, CD, demos CD, t-shirt and other goodies.